Braising is a combination of dry-heat and moist-heat cooking methods. That means meats are first seared in a hot pan with a small amount of fat to seal in the juices and brown them, and then slowly simmered tightly covered in a small amount of flavorful braising liquid until tender. Braising can be done on a stovetop or in an oven but the initial searing of the meat is best done on top of the stove. Meat and poultry aren't the only candidates for braising. Vegetables also can be braised. Braising liquids can be as diverse as one's palate allows but here are the minimum requirements for a tasty braise. Follow these tips for creating the best braising liquid to ensure your dish turns out delicious. Base options - Meat or vegetable stock to complement the protein you are cooking, white or red wine, beer, sometimes milk or another liquid of choice are great choices to start with. Aromatic ingredients - Spices, herbs, bouquet garni or culinary sachet are essential. Mirepoix - Two parts diced onions to one part each diced carrots and celery sautéed until caramelized to help develop deep flavors in the end product. The mirepoix is browned in the hot fat after the meat has been browned. Acid - Vinegar (white-wine, red-wine, apple-cider, rice-wine, balsamic or white vinegar), citrus juice or tomatoes all help break up the fibers of tougher meats. Sugar - If a sweet-sour end-product (as for German sauerbraten) is desired, white or brown sugar, honey or maple syrup can be added. Fat - Butter or oil are sometimes added to help enrich a product, especially in vegetable braises. Salt and pepper - If the object of your braise isn't seasoned prior to browning, salt and pepper can be added to the braising liquid. In a small saucepan, add all the ingredients, including the mirepoix that was browned in the pan the meat was browned in. Bring to a boil. Simmer for 5 minutes. Remove from heat and let cool. Pour enough of the braising liquid into the pan so it comes halfway up the sides of the meat but doesn't cover it. Tough cuts of meat or those from an older animal are prime candidates for this method of cooking because the long, slow cooking of braising tenderizes foods by gently breaking down the rubber-band-like connective tissue that makes it hard to eat. Unless a specific recipe tells you differently, all meats can be braised by using these steps. Create a braising liquid of your choice (see above). Prepare meat for cooking by either leaving it whole or cutting it into pieces. Dry the meat with a paper towel. Season both sides with salt and pepper. In the case of a stew, dredge the meat cubes in flour and shake off any excess. Add a small amount of fat (oil or butter or a combination) to a heavy-bottomed lidded pan, like a Dutch oven, set over medium-high heat and brown the meat on all sides. Remove the browned meat and set aside. Brown the mirepoix in the same pan the meat was browned in. When the vegetables have caramelized, remove them and add them to the saucepan containing the braising liquid. Heat the oven to 300 degrees F if oven braising. Add the cooled braising liquid called for in your recipe, usually enough to come part way up the meat but not cover it, and scrape up the browned bits at the bottom of the pan. Return the meat to the pan. Bring the liquid to a hard simmer, cover tightly and continue to simmer on the stovetop or in the heated oven until the meat is tender. This can take up to six hours, especially if the cut of meat is large. Remove the meat from the pan and keep warm. A sauce or gravy can be prepared from the braising liquid by skimming the fat and making a roux with it in another small frying pan or saucepan. Whisk the roux into the braising liquid, scraping up any brown bits on the bottom of the pan, and simmer until the sauce has thickened. Strain and adjust seasonings. Combine the sauce with the meat, sliced or whole, or pass it in a gravy boat at table. Beef Pepper Steak Recipe - This is an example of a braise prepared on top of the stove. Sliced sirloin steak, mushrooms, bell pepper, onion, garlic, baby corn and tomatoes are simmered in a beef broth-soy sauce braising liquid until tender. 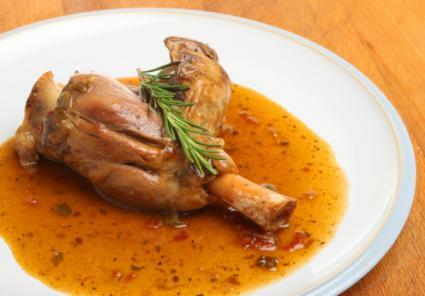 Veal Shanks Recipe - This humble meat cut is transformed into a fork-tender main course that makes its own gravy. In Italian, this is known as osso buco. The same cooking treatment can be applied to lamb or pork shanks, but the cooking time will vary. Swiss Steak Recipe - Braising turns a bottom round steak into company fare especially served with mashed potatoes or rice to sop up all that flavorful tomato-based gravy. Wine-Braised Oxtails Recipe - Don't turn up your nose at the thought of dining on oxtails. This collagen-rich beef product turns into butter when treated to a long, slow swim in a flavorful braising liquid. 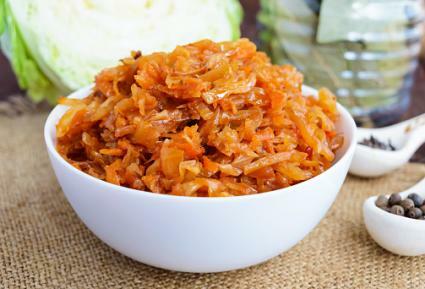 Turn your average vegetable into a mouth-watering meal with these vegetable braising tips. Vegetables most often braised are those with tough fibers like cabbage, parsnips, carrots, celery, fennel, artichokes, beets, escarole and more. Theoretically, any vegetable, tough or not -- like asparagus and endive -- also can be braised. Prepare your braising liquid (see above). If oven braising, heat oven to 400 degrees F.
Clean, trim and cut the vegetables into equal-size pieces so they will cook evenly. Pat them dry with a paper towel. Heat a small amount of butter or oil over medium heat in a heavy-bottomed skillet or Dutch oven with a lid. Add all vegetables in a single layer and cook, flipping veggies with tongs for 2 to 3 minutes or until slightly caramelized. Add braising liquid called for in the recipe, making sure it doesn't cover the vegetables completely. Bring to a hard simmer, cover tightly, reduce heat and simmer for 10 to 30 minutes on top of the stove. If braising in the oven, turn the heat down to 250 degrees F and bake until vegetables are done to your liking, fork tender or al dente, which can take anywhere from 10 to 30 minutes or more depending on the vegetable. The braising liquid can be thickened with a roux or served as-is. Braised Fennel with Olive Oil and Garlic Recipe - Garlic, fennel and lemon lend a Mediterranean flavor to this often-overlooked vegetable ideal for braising. Braised Baby Root Vegetables Recipe - A braise of baby vegetables needs little more than butter, sea salt and fresh chervil or parsley to make a delicious side dish. Braised Potatoes and Escarole Recipe - The braising in this recipe is achieved in a slow cooker that delivers a buttery mouth feel. The dish is complemented by an orange vinaigrette. Braised Chickpeas and Carrots with Yogurt Topping Recipe - Chickpeas, carrots and tomatoes get an Indian-inspired braising treatment in this recipe which can be served as a side or main course when topped on quinoa or another healthy grain. Traditionally thought to be a cooking method for tough foods only, braising methods actually can be applied to any type of meat, even a tender filet, fish or vegetable. Braising liquid and spices are the perfect vehicles for enhancing and even changing flavor as in the case of meats with an undesirable gamey flavor. For instance, juniper berries and apple juice can turn a tough cut of wild boar into a succulent meal. Since tough cuts are typically less expensive, you can experiment without fear of ruining a pricey piece of protein. Let your creativity be your guide.